More than thirty leading child welfare, education and research organisations have endorsed a new call by Early Childhood Australia (ECA) and SNAICC – National Voice for our Children to ensure all Aboriginal and Torres Strait Islander children receive quality early learning and family support. Published today, the joint position paper, Working Together to Ensure Equality for Aboriginal and Torres Strait Islander Children in the Early Years, highlights the key issues that impede First Nations children from accessing early childhood education and care (ECEC), while further providing recommendations for improving outcomes. The data we have tells us that our children are half as likely to attend a Child Care Benefit approved early childhood service than non-indigenous children. Everyone who cares about child welfare in Australia is concerned that too many children are starting school with developmental vulnerability, and that two out of five Aboriginal and Torres Strait Islander children are vulnerable when they start school; that’s twice the rate of vulnerability overall. The most important thing for our children to thrive is that we need ongoing support for culturally appropriate, community-controlled services, and help to improve the quality of those services and professional development for their staff. Children and families are already benefitting from evidence-based, targeted family support services, like Families as First Teachers, Home Instruction for Parents of Preschool Youngsters (HIPPY), Parents as Teachers (PAT) and Best Start (in WA). Invest in quality Aboriginal and Torres Strait Islander community-controlled integrated early years services, through a specific early education program, with clear targets to increase coverage in areas of high Aboriginal and Torres Strait Islander population, and high levels of disadvantage. COAG to fund a targeted program to support evidence-informed, culturally safe, integrated early childhood and family-focused programs, across the nurturing care spectrum, in early education and care services that work with high numbers of Aboriginal and Torres Strait Islander children. 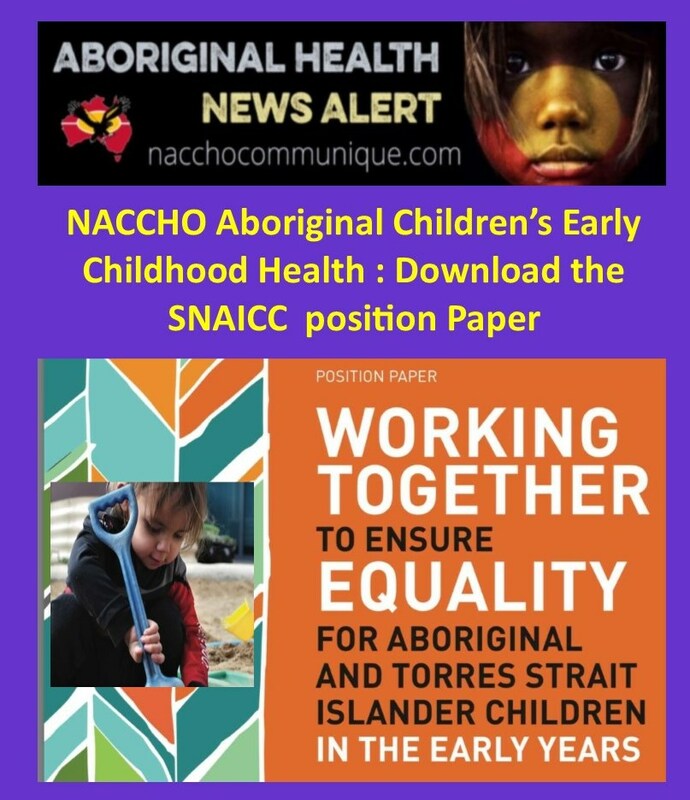 The paper and its recommendations are endorsed by peak bodies, children‘s education and care service organisations and major children’s organisations who all that support the rights of Aboriginal and Torres Strait Islander children including: Save the Children, National Aboriginal Community Controlled Health Organisation (NACCHO); UNICEF, Brotherhood of St Laurence; Australian Council of Social Services (ACOSS); Murdoch Children’s Research Institute; Queensland Aboriginal and Torres Strait Islander Child Protection Peak (QATSICPP); Victorian Aboriginal Child Care Agency (VACCA) and many more. See the full list of endorsing organisations in the position paper. The broad range of support for these recommendations shows the high level of agreement and concern that action needs to be taken to make sure that Australia improves our support for First Nations children to give them the best start in life. Immunisation is a safe and effective way to protect children from harmful infectious diseases and at the population level, prevent the spread of these diseases amongst the community. Australia has generally high immunisation rates which have increased steadily over time, but rates continue to lag in some local areas. This report focuses on local area immunisation rates for children aged 5 and shows changes in immunisation rates over time. It also presents 2015–16 immunisation rates for all children and Aboriginal and Torres Strait Islander children aged 1, 2 and 5. Results are presented for the 31 Primary Health Network (PHN) areas. Where possible they are broken down into smaller geographic areas, including for more than 300 smaller areas and across Australian postcodes. Further detailed rates are available in the downloadable Excel sheet and a new interactive web tool allows users to compare results over time by geography and age group. This local-level information assists professionals to use their knowledge and context for their area, to target areas in need and develop effective local strategies for improvement. Nationally 92.9% of all children aged 5 were immunised in 2015–16. All PHN areas achieved an immunisation rate of 90% or more, ranging from 96.1% in Western NSW to 90.3% in North Coast (NSW). In 2015–16, childhood immunisation rates continued to improve nationally and in most local areas. Although rates vary across local areas, the gap in rates between the highest and lowest areas is diminishing. This report focuses on immunisation rates for 5 year olds and presents results since 2011–12. It also provides the latest information for 1, 2 and 5 year olds for Australia’s 31 Primary Health Network (PHN) areas and smaller local areas. From 2011–12 to 2015–16, there were notable improvements in rates for fully immunised 5 year olds. National rates increased from 90.0% to 92.9%. Rates increased for PHN areas too, as all areas reached rates above 90% in 2015–16. Rates in smaller local areas (Statistical Areas Level 3, or SA3s) have also improved. In 2015–16, 282 of the 325 local areas had rates of fully immunised 5 year olds greater than or equal to 90%. This is up from 2011–12 when only 174 areas had rates in this range. Further, the difference in rates between the highest and lowest areas has decreased over time (Figure 1). 5 year olds – 96.1% to 90.3% (national rate 92.9%). This section presents results for children who were identified as Aboriginal and/or Torres Strait Islander on the AIR. These data are based on Medicare enrolment records. 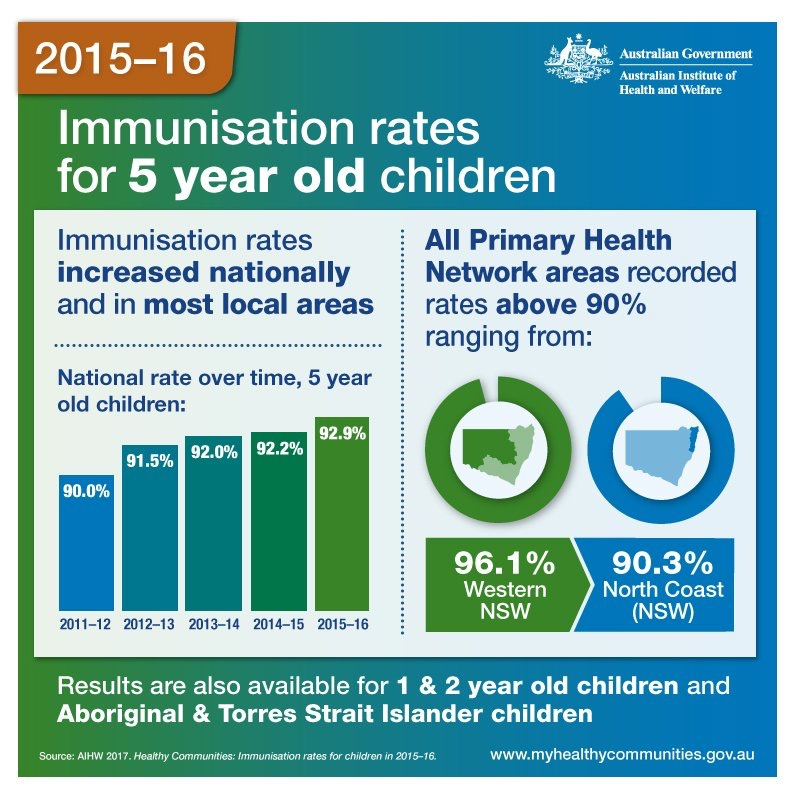 For Aboriginal and Torres Strait Islander children, national immunisation rates in 2015–16 for 1 and 2 year olds were lower than the rates for all children (89.8% compared with 93.0% for 1 year olds, and 87.7% compared with 90.7% for 2 year olds). In contrast, the national immunisation rate for Aboriginal and Torres Strait Islander children aged 5 years was higher than the rate for all children (94.6% compared with 92.9%). In 2015–16, the percentages of fully immunised Aboriginal and Torres Strait Islander children varied across PHN areas for all three age groups as shown in Figure 6. The range in immunisation rates across PHN areas for the three age groups is outlined below. 5 year olds – 98.8% in Gold Coast (Qld) to 89.4% in Western Victoria. For Aboriginal and Torres Strait Islander children, Statistical Areas Level 4 (SA4s) were used instead of SA3s as the smallest geographic areas. There are larger populations in SA4s and this allows more reliable reporting for smaller population groups such as Aboriginal and Torres Strait Islander children. 5 year olds – ranged from 100% in Murray (NSW) to 87.6% in Perth–South East (WA). # Interpret with caution: This area’s eligible population is between 26 and 100 registered children. Data are reported to one decimal place, however for graphical display and ordering they are plotted unrounded. These data reflect results for children recorded as Aboriginal and Torres Strait Islander on the AIR. Levels of recording may vary between local areas. Source Australian Institute of Health and Welfare analysis of Department of Human Services, Australian Immunisation Register statistics, for the period 1 April 2015 to 31 March 2016, assessed as at 30 June 2016. Data supplied 2 March 2017. Vaccination remains the best protection pregnant women and their newborn babies have against influenza. Despite influenza vaccination being available free to pregnant women on the National Immunisation Program, vaccination rates remain low with only 1 in 3 pregnant women receiving the influenza vaccine. Influenza infection during pregnancy can lead to premature delivery and even death in newborns and very young babies. Pregnant women can have the vaccine at any time during pregnancy and they benefit from it all through the year. ” The almost 19,000 Aboriginal and Torres Strait Islander children in out of home care each year need the highest quality support if we are to break these cycles of harm. As we come to recognise the devastating mental, physical and social impacts of trauma, grief and abuse across generations, and understand just how widespread this problem is for all children, the need to treat child abuse and neglect as a public health issue is clear. This approach means better understanding the problem, its causes and impacts, and the strategies to best prevent and respond to it. Child protection and out-of-home care have been the subject of multiple inquiries and reviews, and 2016 has been no exception. This year there have been four separate royal commissions into child protection and the related factors of family violence, child sexual abuse, juvenile detention and the systemic failures in these areas. 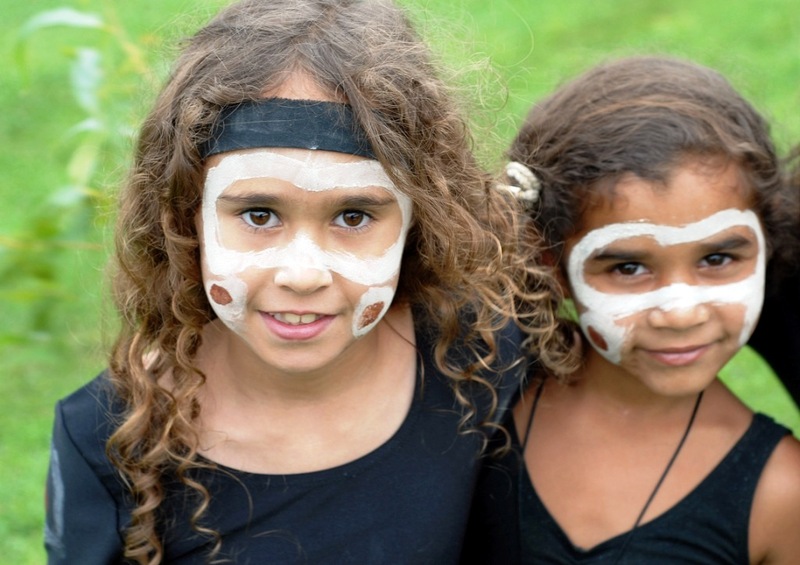 The Victorian Commission for Children and Young People recently released two reports examining the failure of both government and non-government organisations to implement policies and services for Aboriginal children that will safeguard their cultural connections. The inter-generational issues that have stemmed from the forced removal of Aboriginal children from their families and communities – and the resultant trauma experienced by so many – have been the focus of concerted action and advocacy by Aboriginal leaders, peak bodies, organisations and community groups since the 1970s. But in these most recent reports, we see familiar concerns. 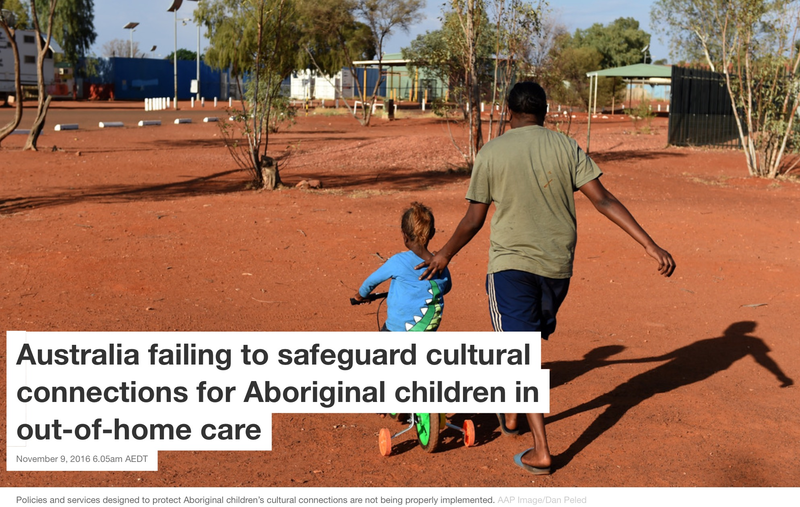 These include the widespread lack of implementation of the Aboriginal and Torres Strait Islander Child Placement Principle and the lack of cultural care planning for Aboriginal children in out-of-home care. 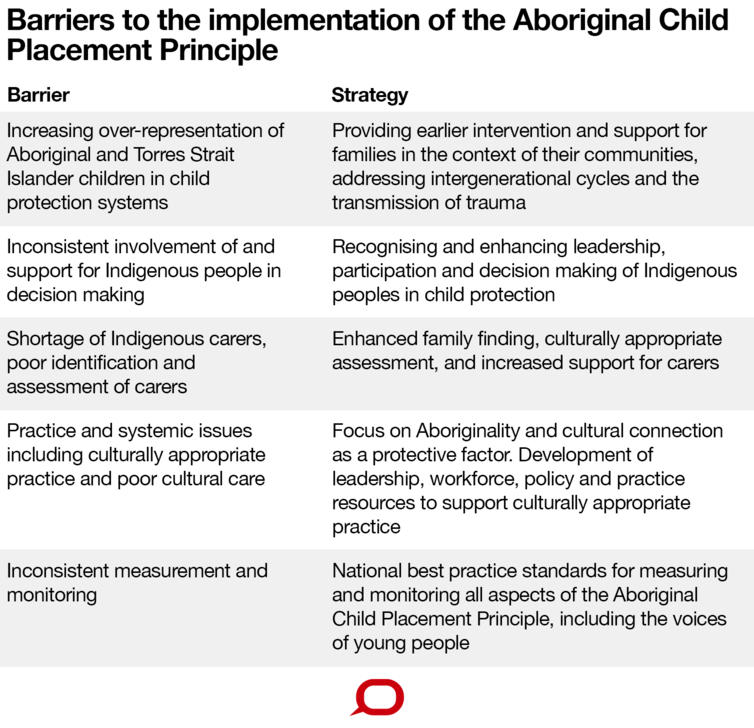 The Aboriginal and Torres Strait Islander Child Placement Principle (the principle) is often described and legislated as a “placement hierarchy”. Under the principle, placement choices for Aboriginal and Torres Strait Islander children who can’t remain with their parents start with family and kin networks. That is followed by non-related carers in the child’s community, and then other Aboriginal caregivers and non-relative foster carers. These aspects of the principle are often overlooked, or not implemented, because they are not included in legislation. Nationally, the impact of the principle has crudely been measured through figures from the Australian Institute of Health and Welfare which assess the Aboriginality of caregivers and their relationship to a child. However, the reports from the Victorian Commission, together with similar audits in Queensland, have highlighted the reality behind the numbers. These reports show minimal practice compliance with the principle, and high levels of variability within and across jurisdictions. For example, a number of children are not correctly identified as Aboriginal, which means there cannot be adherence to the principle for these children. Similarly, despite policy intent and available programs, there is minimal compliance with several practice aspects including the use of family decision making meetings and strategies to maintain cultural identity. We’ve examined why this policy and practice disconnect exists when it comes to the safety and well being of Aboriginal children. There are several factors that act as barriers to implementation of the principle, not least of which is the increasing over-representation of Aboriginal children in child protection systems across Australia. If we’re going to improve conditions for Aboriginal children in child protection and out-of-home care, we must focus on breaking inter-generational cycles of trauma. We also need to make sure children feel “culturally safe”. That means they don’t face challenges to or denials of their cultural identity; of who they are and what they need. We must recognise the protective properties of cultural connection, rather than viewing culture as a risk factor, and engage communities in determining the solutions most appropriate for them. In addition to the work being undertaken as part of the National Framework for Protecting Australia’s Children, major national grass roots initiatives are driving this change. National Aboriginal and non-Aboriginal organisations – for example, SNAICC, the Aboriginal and Torres Strait Islander Healing Foundation, Winangay Resources, and the Australian Centre for Child Protection – are leading the Family Matters and Positive Futures initiatives to find alternative approaches to support Aboriginal children, their families and communities. Article by: Ruth Armstrong, Senior Deputy Editor – Medical Journal of Australia, Sydney, NSW. This issue of the MJA, timed to coincide with NAIDOC Week, is devoted to exploring the health status of Australia’s Aboriginal and Torres Strait Islander peoples — particularly our children and young people. Children aged 0–14 years make up 35% of the Australian Indigenous population, write Eades and Stanley. Data on their health and development are patchy but indicate a growing divide between Indigenous and other Australian children for several risk factors and conditions. Azzopardi and colleagues add a systematic review of the evidence for young people aged 10–24 years into the mix, finding gaps in the observational research for urban settings, mental health and injury, and confirming the well known dearth of interventional studies. Two studies in this issue add to the scant evidence available by testing simple interventions that might lead to improvements, such as providing subsidised fruit and vegetable boxes to disadvantaged families in regional towns (Black and colleagues) and swimming pools in remote communities (Stephen and colleagues). Turning our thoughts to the health needs of Indigenous children is always important but is particularly timely now. A federal election, with all its potential for policy upheaval, is just 2 months away. In the first article in our pre-election series, Arabena recognises an urgent need for better data to evaluate existing and future policies, and envisages a plan for health that takes Aboriginal and Torres Strait Islanders’ perspectives, wishes and culture into account, and brings an end to aspects of the health system that contribute to inequality, such as racism. Independently of the election, the Australian Government is developing a new National Aboriginal and Torres Strait Islander Health Plan for the next decade. Kimpton, president of the Australian Indigenous Doctors’ Association, says the plan will have the best chance of success if it has at its heart some important principles: nurturing of the Indigenous health workforce; genuine, strong partnerships with Indigenous organisations; fostering culture as integral to health and wellbeing; and promoting Indigenous leadership, while involving the whole health system. The solutions to many health problems for Indigenous children lie outside the health system, but making our health services accessible, culturally safe and appropriate places will lead to better outcomes for the families who inevitably need them. “Cultural competence” can be a daunting term for doctors. Thackrah and Thompson encourage us to look at our own culture of medicine and the practical realities of patients’ lives when trying to put this difficult concept into practice. Amid all this thinking and soul searching, there are good examples of what works — innovative health promotion and education programs combining the nurturing effects of “country” with exchanges of new knowledge (Webb and colleagues), and thriving health services where Indigenous families can truly have their health needs met and that also serve as centres of outreach bringing sorely needed medical expertise to remote communities (McGilvray). As Milroy reminds us in her response to a study that found many Aboriginal children had been exposed to traumatic, potentially health damaging experiences (Askew and colleagues), Indigenous children need access to the best possible health services right now and for years to come. History tells us that policies fail, and services falter, when they are not developed in consultation with those for whom they are designed. On this point, Eades and Stanley concur: “… we believe that Australian services have failed to close the gap in child health because they have been developed without involving or engaging First Nations people”. At this important time in Australian history, we have yet another chance to get it right. Be it by public policy or individual action, we need to do all we can to make our health services places of healing for Aboriginal and Torres Strait Islander children and their families. Enter your email address to follow NACCHO and receive notifications of new posts by email.